Three films will be shown, one on each night, with discounts available for the last two films with a purchase of a full price ticket on Friday the 28th (click link above for details). On Friday, September 29th, “Covadanga” will be shown, and director Sean Harofilis will make an appearance. On Saturday, September 29th, “Cardboard Gangsters” is the film, with director Mark O’Connor in person. Finally, on Sunday the 30th, “Mother’s Day” is screened, with director Fergus O’Brien appearing on behalf of the film. An Opening Night party will be at the Emerald Loop Bar and Grill nearby the Film Center at 216 North Wabash Avenue. The Founder and the Producer of festival is Mike Houlihan, who is a fixture in the Chicago entertainment scene as an actor, stand-up comedian, radio personality and filmmaker. In the 1990s, he did a one man show called “Goin’ East on Ashland” that ran for six years, and had a world premiere in 2000 with his play “Mickey Finn” at Chicago’s Royal George Theatre. In 2009, he wrote and was featured in the film “Tapioca.” and released a documentary in 2013 entitled “Our Irish Cousins.” He can be heard on “The Skinny & Houli Show” on WCEV-AM. In a Podtalk with Patrick McDonald of HollywoodChicago.com, Founder/Producer Mike Houlihan talks about the Irish Movie Hooley, his Irish roots and how he would convince a South Sider to come north of Madison Street. 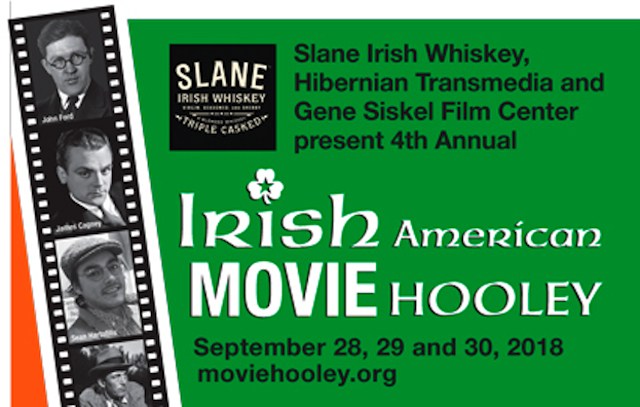 The Gene Siskel Film Center and Hibernian Transmedia presents the Irish American Movie Hooley 2018 from Friday, September 28th, through Sunday, September 30th (various times), at the Film Center, 164 North State in Chicago. For more information regarding the Gene Siskel Film Center, click here.